A diagram depicting the ‘fuccboi glass ceiling’ has been doing the rounds on Instagram and Reddit lately, having originated in London’s satirical political/fashion/feminist magazine Mushpit. The diagram places several fashion brands – mostly focused on streetwear – under four labels: innovation, aspiration, absorption, and iteration, with varying levels of disapproval. While Comme des Garçons, HBA, and Telfar are branded ‘high fashion’ (and, thus, fall under the innovation category and above the queer threshold) Bape, Vetements and Raf Simons have to settle for ‘aspirational’. Meanwhile, Palace and Supreme emerge from the murky heterosexual soup which swims at the diagram’s bottom. Obviously, all of this has led to plentiful sounding off in comment sections about who’s who and should fall where. But Lucas Mascatello, the artist, strategist, and creator of New York newspaper Civilization that contributed the ‘fuccboi glass ceiling’ diagram to issue 10 of Mushpit, seems to take it pretty seriously. 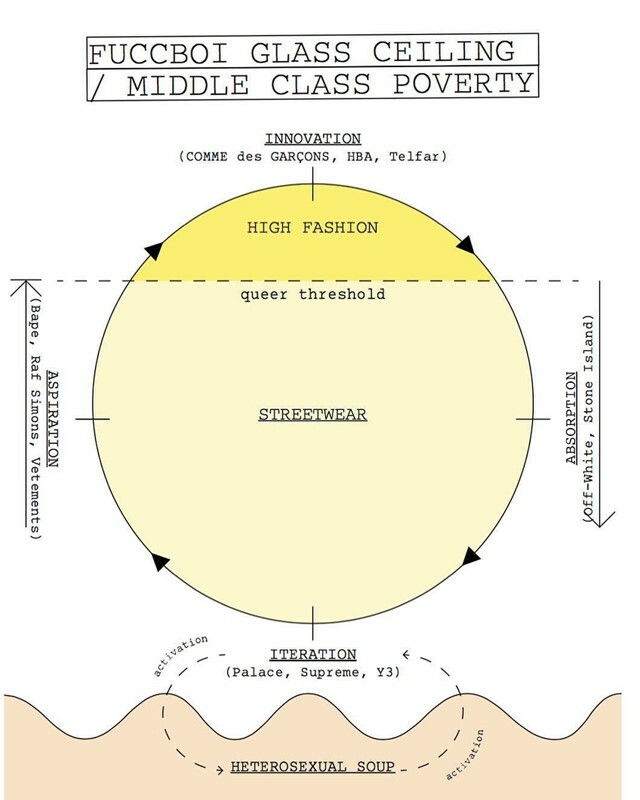 So the diagram isn’t just a bit of fun, but a genuine critique of streetwear brands and the culture they’ve spawned. “It’s really about how straight white teenagers ruin fashion by supporting brands that commodify and deradicalise countercultural ideas,” Mascatello adds. This explains the addition of a ‘queer threshold’ to the diagram – above which one is safe from the artist’s sartorial shade – and the aforementioned heterosexual soup.